Serie A giants Juventus are understood to hold no interest in pursuing the signature of Mesut Ozil from Arsenal when the transfer window reopens. Ozil had endured a tough period since the previous international break and he has either been benched or left from the matchday squad altogether in the past five matches. A back injury has been given as the prime reason behind his recent absence but the German is nevertheless said to be concerned about his future under Unai Emery. According to Calciomercato, Ozil's entourage are understood to have made contact with the Bianconeri but the move has come to no avail with sporting director Federico Paratici knocking back the approach. 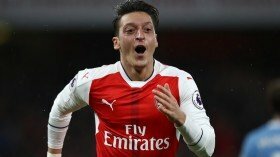 It is added that the Serie A champions have no plans of holding discussions with Arsenal regarding the same and Ozil may have to look elsewhere, if he wants to pursue a fresh challenge away from the north London side. Emery has recently confirmed that Ozil has returned from the nagging back problem and he could feature for them during the midweek Europa League game versus Qarabag.